Beyond being nominated for 91 Emmy awards, Netflix has something else to be proud of. The video streaming service said on Monday afternoon that it added over 5.2 million new subscribers during its second quarter, which was up 1.7 million over the same period one year ago. Across the U.S., the company increased its subscriber base by 1.07 million which easily surpassed last year’s increase of 160,000 during the same quarter. While its core market is still U.S., this was the first quarter that its total international users represented the majority or 50.1% of its overall customer base. Revenue and earnings all beat expectations on Wall Street as the results from Netflix appeared to be strong in every facet. The positive results come at a time of concern that the streaming service behemoth was feeling pressured from producing a large number of movies, series and other shows. In May, The Get Down was canceled by Netflix and reportedly cost over $120 million to produce. Sense 8 developed its own cult following, but was also cancelled. On Monday, during a quarterly conference call, CCO of Netflix Ted Sarandos said that the company has a renewal rate of 93%. It appears as though a few cancellations have not upset subscribers enough to leave and join another streaming service. Shares of Netflix were up over 10% in trading after hours. The stock has close to doubled over the past 12 months. As far as television is concerned, Netflix touted its 91 Emmy nominations that were second to just HBO. High-profile nominations included Stranger Things, Master of None and House of Cards. Looking forward, Netflix is expecting to add another 750,000 members across the U.S. and another 3.7 million in their international base during the ongoing quarter. Traditionally Netflix has added more subscribers internationally due to being a new player in the majority of its markets overseas. The business is difficult to predict and we believe the drive is adopting of internet television, said a Wall Street analyst. 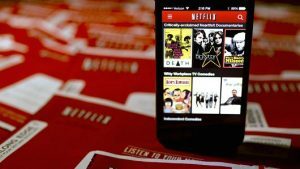 Netflix predicted earnings per share of 32 cents during its third quarter. Analysts on Wall Street, who follow the company, were expecting earnings per share of 23 cents. Overall, the company posted profit in the second quarter of $66 million equal to 15 cents per share in comparison to $41 million equal to 9 cents per share one year ago. Revenue ended the quarter at $2.8 billion up over 32%.